La Maison Dumas (circa 1757) is an officially registered 4 star tourist residence and proud member of CITQ (Corporation de l’industrie touristique du Quebec). This elegant, 1,200 sf, one bedroom tourist apartment is situated on the first floor of a stone heritage home classified as one of the oldest homes in Old Montreal. Just a minutes walk to the Old Port, shopping and restaurants, experience true old-world charm with hand-hewn beams, pinewood flooring and exposed stone masonry along side the modern conveniences that discriminating travelers demand. For ultimate comfort and privacy, the main living areas have been divided into a den and living room. As is all the property, the living room is professionally decorated with only the highest quality furnishings including: plush down sofa, mahogany entertainment center, captains’ club chairs, original artwork and marble coffee table. A cozy gas fireplace adds charm and ambiance. Watch your favorite programs on a 52” plasma TV. Cable television, including many of the most popular channels like HBO and The Movie Network are provided in both French and English. There is also a DVD/BlueRay player with numerous DVD's for your entertainment. Also included is a stereo system and many CD's are provided. At the opposite end of the apartment is a den complete with: large working desk, comfy Louis XVII reading chair and unlimited WiFi access. The large sofa has a comfortable queen-size mattress for additional guests or children occupying the apartment. Next to the den, a 19th century French walnut dining table accommodates five people. Whether you plan an elegant dinner at home or just a quick bite before going out for the day, La Maison Dumas has everything you need to create the right ambiance. The kitchen has been fully refurbished and is well equipped including: concrete countertops, (5) appliances, microwave, cappuccino machine and much more! The bedroom has a comfortable, pillow top queen-size bed complete with fluffy European down comforter and pillows to make your sleep luxurious. The bathroom is outfitted with heated marble floors and custom shower. We also provide plush towels, crisp white linens, hair dryer and a private washer/dryer.? Well located in the Old Port, La Maison Dumas is a short walk to Montreal's major attractions such as: the Montreal Grand Prix, Montreal Jazz Festival, Montreal Just For Laughs Festival, year round international fireworks displays, free concerts and the Underground City.?? Metro (subway) service or bus service is within a five minute walk. Easy access to La Ronde Amusement Park, Casino de Montreal, Biodome, Science Museum, IMAX Cinema and Mont Royal Park is available. Watersports/recreation are within walking distance. Winter sports and resorts are within a one hour drive. While every subsequent owner of La Maison Dumas has left their impression on the house, extensive renovations by the current owner has allowed her to open the guest apartment to the public in 1997 and resulted in the beautiful building seen today. The proprietor, Cherie Gregor, remains committed to the on-going restoration of La Maison Dumas and the revitalization of Old Montreal. Spending your vacation here is a unique opportunity to experience the authentic past of our beautiful city. La Maison Dumas is the only single family home remaining in the Old Port of Montreal. Secure outdoor parking is available upon request for $20 per day.Please ask for details. This was a great surprise! Terrific, compact, well decorated, clean and conveniently located! 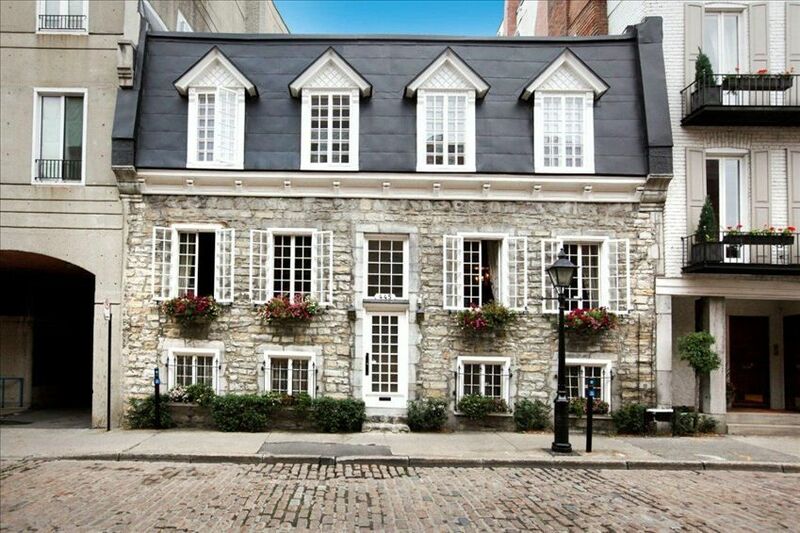 Fantastic accommodation in the heart of Old Montreal. We enjoyed staying in a historic setting and all of the facilities in the property were great and we were well looked after by our host. This was the perfect place to spend a mini honeymoon - charming, historic, beautiful, and conveniently located to attractions and an abundance of cocktail bars and restaurants. We will definitely be back! This apartment is the best place to stay in Montreal. Charming, cozy, historic, well-cared for. We stayed at this lovely apartment for the second time as we loved it so much the first time. It is in a wonderful quiet neighborhood, the owners are present and very helpful. The apartment has lovely ambiance; it feels historic, and special. The kitchen is conducive to cooking and the living room invites reading and lounging by the gas fireplace. We highly recommend staying here! Well-appointed, cozy apartment, perfect for two. Great location for walking around the old port area, close to so many restaurants, shopping and attractions. Would stay here again! A great character apartment...clean, well appointed, perfectly located in the old town. Very highly recommended. Well located in the Old Port, La Maison Dumas is a short walk to Montreal's major attractions such as: the Montreal Grand Prix, Montreal Jazz Festival, Montreal Just For Laughs Festival, La Ronde Amusement Park, year round international fireworks displays, free concerts and the Underground City.! !